Strawberries are one of our favorite fruits. And when we finally saw some beautiful ripe berries at the store this week, we knew we had to take advantage and turn these into a delicious dinner! Tonight we are making a spinach strawberry salad with grilled balsamic chicken and topped with our homemade strawberry balsamic vinaigrette. We start by brushing the chicken with balsamic vinegar, seasoning it up with garlic powder, salt & pepper and grilling until browned on the outside and juicy on the inside. This salad is so simple and delicious too! Start with a bed of nutrient-dense baby spinach leaves, add fresh sliced strawberries, a touch of part skim mozzarella cheese, almond slivers for crunch (no calorie packed croutons needed!) 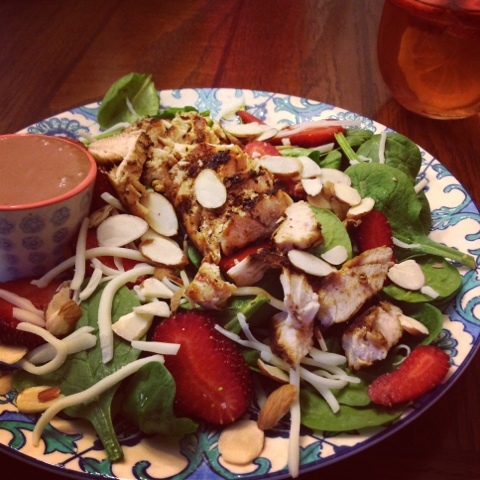 and top with our sweet, creamy strawberry balsamic dressing. This dressing is one of our new favorites and it couldn't be simpler! Not too mention, it's super healthy because it's sweetened up with fresh fruit instead of sugar. To make it, just blend up fresh strawberries, balsamic vinegar, extra virgin olive oil, honey dijon mustard, and garlic. It is the perfect balance of tangy and sweet and has a thick, creamy texture thanks to beautiful, fresh strawberries chunks. 1. To make dressing, add 3 chopped strawberries, balsamic vinegar, olive oil, minced garlic clove and honey Dijon to blender. Season with salt & pepper. Blend for 60 seconds until smooth & creamy. 2. Brush both sides of thinly sliced chicken with balsamic vinegar and season with garlic powder, salt & pepper. Slice cooked chicken on an angle into thin strips. 3. Heat grill pan over medium high heat and grill chicken until browned - about 5 minutes on each side. 5. Place a bed of spinach on each plate (makes 4 servings), top with 1/4 of your strawberries, 1/4 of your cheese and 1/4 of almonds. Top each salad with 1/4 of your chicken or one thin sliced breast. 6. Drizzle with 2 tbsp of dressing and enjoy!